If you are going to break into a home, make sure you know your target. Written in 1994. I'll tell you what I'm gunna do, this here is what I'm gunna do and when you hear what it is, you're gunna love it! I'm tellin' ya, you gunna go crazy, you know what I mean? Batshit! Matter of fact, I reckon you're gunna lose your head when you hear what I'm gunna do. THIS is what I'm gunna do. I'm gunna pull out this nice, long, elegant, even svelte Katana. Do you know what a katana is? Here, lemme show ya. This here. Glinting hypnotically in the ethereal candlelight of this house you entered without permission, with ill intent in your back pocket, is a katana. Like it? I detect by your eyes a hint of recognition, but what do you recognise? The Katana in itself or the incredibly purposeful look of it? The katana most certainly was purpose-built you know?You probably do know anyway. And you can probably see how actually you're gunna lose your head. As the incessant dripping somewhere off to his left droned on its path to insanity, the man in the chair became keenly aware of his predicament, as if it had thumped him in the chest with the weight of an elephant. As he coerced his eyes to look away from the steel that danced enticingly before him, he noticed that attached to the steel was a man. Well, it looked like a man except for the razor sharp eyes and that malevolent grin. And it looked like it was talking to him. Notice the unmatched craftsmanship, especially in the almost liquid sheen of the blade. Notice also, how readily it will slice through human flesh. You didn't even feel that did you? No! You won't start to feel it until it’s way beyond actually knowing what the all-consuming white flame taking precedence over your senses is. By now, you are completely aware of what is happening. You can't feel it, you can't fight it, but you can contemplate the ultimate effect. 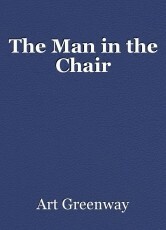 The man in the chair watched the steel flash in a sing-song arc towards his belly. As he let his head loll to see if he was hit, he was lightly amused to see that the middle of him was grinning and poking out its tongue at his captor. Lifted by his torso's audacity, he poked his own tongue at the steel. I can see that you are destined to disappoint me, lose your honour in my eyes, if you like. That means only one thing. I'm not gunna finish you off. I'll probably leave you to the pain. When it comes. See, I've only cut you the once. Already though, you are starting in on madness. You'll start blithering pretty soon and that is when I'll know that you will be forced to keep your head squarely on your shoulders. If you did have your wits about you you'd probably be wondering as to why you can't feel that gaping, but clean, almost surgical wound. I'll explain it anyway, just for your posthumous benefit. What I have done is to perform a very involved and not practised within the law medical procedure. Just like an epidural, only in above the 4th vertebra. In effect, numbing you from the chest down. You may notice that your arms are strapped to the chair. They still work. You WOULD feel it if I sliced one of them. As he swam calmly down the River of Why to the Sea of Insanity that lay directly ahead, the man in the chair was flung back across the treetops of reality as an avalanche of fire scorched his left elbow. Looking directly at the stump that used to be his left arm, in his periphery, he caught a movement that required his attention. Swivelling his head down he saw his own fingers twitching on the end of his own forearm as it lay on the floor beside his chair. A sound, like that of a cat being choked, filled his head. He was perturbed, but unaware that it was his own scream. Ah, that got your attention didn't it? Lemme just wipe this clean again. There. Told you this Katana was good, didn't I. I know that you haven't got a clue where you are or how you got here. It is a dingy place, smells a bit too. But you may remember WHY you're here. Oh, by the way, the chemicals will wear off soon. You'll know when! Think back to the last thing you were doing before you got here. Wherever here is. Lemme help. How about a spacious living room with lots of expensive looking silverware, large, but not dominant, teak-look dining table with a state of the art lookalike stereo set-up, surround sound, the whole shootin’ match. Don't remember yet? Let's see if we can give you an extra prod. What I have here is hot pitch. This'll seal up that stump of yours so you don't bleed to death too early. Looks like y've done your dash, Madman. You'll never remember now why this is happening to you. You won't remember entering my home at 2:36 am, armed with sawn-off shotgun (just in case? ), attempting to abscond with my personal belongings. You certainly won't remember being clubbed, with finesse, across the back of the skull with a Gray's hockey stick before being carefully conveyed to this here cellar. You've probably already mislaid your own identity. No mind. I've got smokes, mull and some beer, I'll cut you a few more times here and there then sit back and watch the show. You broke into the wrong house buddy! As the storm heightened, the man in the chair was catching fewer and more fleeting glances of eyes and teeth. One time, as he crested a wave, he noticed a red spot of fire between the teeth. He dismissed it in one breath. The waves ceased and the cool waters of madness were instantly replaced by a massive pool of molten metal. As the white heat chewed through his self like so many piranha, he uttered one last, desperate cry, before sinking below the surface where nary a sign of him was left. © Copyright 2019 Art Greenway. All rights reserved.